Kia never ceases to amaze me. Even though the 2018 Kia Sportage enters its first model year as a carry-over from 2017, one would never know from the looks of it. RTM's 2018 Kia Sportage SX AWD test model made for strong competition in its crossover class no matter what the model year was branded onto its name. Driving it around town and on California often-rough roads and freeways inspired lots of approving looks and thumbs up. That's when I knew it was special. Its wide solid stance offers a strong sense of safety and security especially with the all-wheel drive. Considered a small crossover SUV, it still provided a sense of power and strength, creating the illusion of being and feeling much bigger than one is, much like a peacock when it extends its beautiful feathers to appear larger to its competitors. C'mon Mac truck, bring it on! Not all vehicles provide that feeling of security especially for women drivers who are highly sensitive to their personal safety when out and about on the road alone. The Sportage also provides a sense of pride when driving it. Many vehicles don't; more like 'I wish I could hide under the dashboard at this red light!' However, the 2018 Sportage innately made me sit up straight, chin up, shoulders back, clearly owning my ride, an SUV proud to be seen in. That counts! Not everything about owning a car is about what's under the hood. It's also very much about how a vehicle reflects who we are, how we want to be seen in the world, as well as personifying our busy lifestyle or stature in life, whether it be as a business owner, a professional athlete, a proud family of four, or an active single mom driving herself and kids to their martial arts classes. The 2018 Sportage crossover SUV wraps up its occupants with warmth and style, yet plenty of wiggle room, accommodating any and all mind sets with its stunning good looks inside and out. 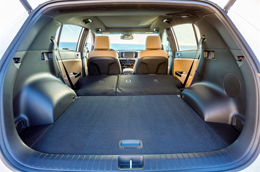 Speaking of wiggle room, the Sportage SX has oodles of cargo space for all of the above, hmmm, even enough for a canoodling couple in love on California's famous Mulholland Drive overlooking the sparkling sea of city lights blanketing Los Angeles all the way to the Pacific shoreline, if you know what I mean! Speaking of blankets, bring one, it can get chilly up there without a sweater on or anything else, for that matter. Not that I would know! Just when I thought Kia couldn't top their game or excel above their class competitors, they proved me wrong. I remember when Kia hit US soil and trust me, it was nothing to write home about. But fast forward a couple decades and it's clear they've put their noses to the grindstone with clear intent to not only compete but to beat. Don't underestimate this product or company. Its vehicles are solid in style, performance and determination, definitely something to write home about. In fact, my daughter just purchased one (with my blessing) and she can barely write home about anything else. 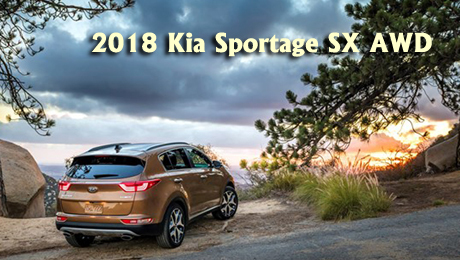 Because of the its power and strength, the 2018 Kia Sportage has been added to RTM's new RV & Camping Channel under 'Great Towing Vehicles' so if you're an RV fan, a boater or a jet ski or snow mobile lover, look no further. The Kia Sportage is highly recommended with a towing capacity of 2000 pounds, when properly rigged, out-towing competitors in its class by a whopping 500 pounds. Don't let the Korean-made brand turn you off as not made in the USA. South Korea is one of America's largest trading partners on the planet for goods and services. Supporting this product means supporting jobs here and there, on both sides of the Pacific. South Korea is one of America's biggest allies as we are theirs. Consider them your family, having your six, especially with 30,000 American soldiers stationed there protecting our interests from the bad boys of the North. 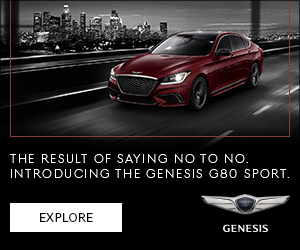 So, fear not, buying a Kia is just as good as buying American for those who may not have all the facts during their car-buying research! It's important to have all the facts up front before making any major decision. The Kia Sportage is a smart decision! Kia’s award-winning vehicle offers advanced technology and greater options across three trim levels—LX, EX, and SX—in the popular subcompact utility segment. A new technology package, previously available starting at EX trim, is now available at the LX level, delivering Blind Spot Detection, a Lane Departure Warning System, and Rear Cross Traffic alert1. The EX trim receives a new Sport Appearance package and optional heated rear seats, while the SX adds an electronic parking brake for 2018. All trim levels are still available with optional Dynamax full-time all-wheel drive. 1. These systems are not substitutes for proper and safe driving, parking, and/or backing-up procedures. Always drive safely and use caution. These systems may not detect every object behind or alongside the vehicle or in the vehicle’s blindspot or direction of travel. 2. MSRP excludes destination and handling, taxes, title, license fees, options and retailer charges. Actual prices set by retailer and may vary. 3. Based on EPA estimates. Actual mileage will vary with options, driving conditions, driving habits and your vehicle’s condition. For more info, visit Kia.